Imagine yourself as a somewhat likely character of Indiana Jones on a quest for the Book of Ra in the ruins of ancient Egypt. Novomatic’s slot The Book of Ra captures the player in an adventure filled with treasures and hidden wealth. 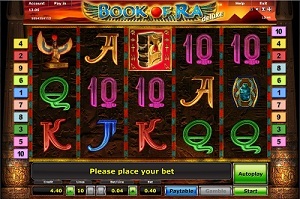 The Book of Ra Deluxe is a 10 line, 5 reel video slot. The symbol, The Book of Ra, figures as the scatter and will substitute for all symbols. If you’re lucky and get three or more Book of Ra symbols, you will trigger the free spin feature. Within the free spin feature, you can get the randomly expanding special symbol that covers all three positions and pays on all. You can also trigger the free spin feature over and over again within the feature. The Book of Ra Deluxe is a great Novomatic slot machine with an amazing feel of adventure and mystique, set in the ruined temples and vaults of the ancient Egypt. Graphics & Appearance: The Book of Ra Deluxe slot has improved the sound and the graphics from the original Book of Ra slot. Instead of the original 9 line & 5 reels, The Book of Ra Deluxe offers 10 lines on 5 reels. Gamble Feature: The Book of Ra Deluxe also has a double up feature where you can choose to double your winnings by a 50/50 chance. You have to pick a card, red or black. Once you have made your choice the card is revealed and your winnings either double or lost, depending on the outcome. Game Symbols: The scatter symbol is the Book of Ra symbol which substitutes for any of the other symbols. If you get three or more on any of the reels, the Book of Ra symbol will trigger the bonus feature (free spins). The Book of Ra slot also includes symbols like the Adventurer, a Pharaoh, a Scarab and the symbol of the goddess Isis. The lower paying symbols are the 10, Jack, Queen, King and the Ace symbols. Bonus feature: The bonus feature on Book of Ra is based on free spins. Once you trigger the free spin feature by hitting three or more Book of Ra symbols, you will be awarded 10 free spins, which for some may seem to be a cheap bonus feature, but the Book of Ra bonus feature will allow you to re-trigger the free spins as you are already inside the feature, over and over again. This means that you will be likely to be awarded more than the initial 10 free spins once you trigger the bonus feature. The first thing that happens after hitting the three scatter symbols and trigger the Book of Ra bonus feature is to be given a special symbol which will be your free spin symbol throughout the bonus feature. The Book of Ra special free spin symbol is randomly given to the player and will be shown above the reels. Your special Book of Ra symbol will payout when it appears anywhere on the reels. They will also payout as normal paylines. Once the free spin feature is activated and the reels start to spin, your special Book of Ra symbol will stand out from the other Book of Ra symbols by being highlighted with a stronger background and a thicker frame. When you hit your special Book of Ra symbol on the reels, they will expand to cover the entire reel which they appeared on. For example, if your special Book of Ra symbol is appears on three reels, your symbol will expand to cover all of those three reels. The Book of Ra bonus feature payouts is based on all your special symbols that cover your paylines. The Book of Ra bonus feature can be re-triggered by hitting three or more scattered Book of Ra symbols anywhere on the reels. You will then be awarded another 10 free spins. Once your free spins are used, you will see the total amount of winnings and the total number of free spins used during the feature. Betting Options: The Book of Ra Deluxe offers you to bet on 10 lines / 5 reels. The coin size can easily be configured by using the + and – symbols. Game Features: The Book of Ra Deluxe has some nice features such as the Autoplay function where you will be able to set the number of spins that will start automatically. If you wish to stop the Autoplay feature, just click on Stop. « More slotmachines guides Article last updated: Wednesday, January 10, 2018.